I share my recent experience and views on National, Dadant and Top Bar hives for the future that I sent to Thorne of the UK who make many. That is not very polite a form of address actually, it should be Ladies and Gentlemen sor Dear Madam, Sir but in English they are not consistent with this concept....PEARLS BEFORE SWINE ! as Oscar Wilde said ! Ladies before Gentlemen ! May I point out some faults in products I have had the misfortune to experience first hand recently myself and the views of LT beekeeper Madame Queen Bee regarding the picture on page 11 of your March 2015 Catalogue...of a named DADANT Hive. 1. That Dadant on your page 11 is NOT a REAL DADANT hive ! it is a stack of layered boxes on your picture ! that is not how DADANTS are ! DADANT Hives are SOLID ONE UNIT FRAME HIVES that INSIDE have 2 levels of Frames ! separated sometimes by a Queen excluder and at the base there is place for varoe mesh or plastic sheet. The base of the hive is not wire mesh open but solid pinewood, 1,5cm thick outer wood, peaked roof with metal top over the roof wood which has big space for insulation cushion. Inside the hive has solid marine plywood end frames for the winter insulation in addition to at least 4cm thick cushions also for the sides of the frames left in for the winter at the base level of frames, the top frame level being removed for the winter. There are often 2 entrances for the bees, and several wire mesh ventilation panels on the outside of the hive sides. Close to the roof in fact to be precise. Landing boards and a cover over the entrances made of fold back when not in use for protection against rain and snow to the entrances of the bees, the entrances can be reduced for winter time and have mouse guards of metal fitted or pollen traps added to catch the pollen as the bees enter the hive and it brushes off their legs for those that collect pollen for sales of that. NO part of a Dadant hive is an unsecured item that would slide off if not sellotaped etc as is unfortunately the design of the Faulty for this need National Hive stacked boxes without clips of any kind to make the hive secure ! Please consider therefore, removing this misleading picture of a DADANT hive from your advertising and replacing it with ? THIS ! options for 12, 16 or 22 Frame size Dadant hives....now 16 frames on 2 levels is the LT standard I am told, meaning the hive has 32 frames in total in it. 22 frame hives have 44 frames in them, 12 frame hives 24. 2 layers times the number of frames on 1 level principle. The DADANT does NOT go higher than that ! 2 levels ! and the roof is an easy to lift up and stay in the air secured by metal attachments while looking in the hive ! it does not COME OFF or need putting on the ground like the unsecured National hive jigsaw leaning tower of Pisa style hive ! 1. Better insulation against heat, cold and wet. I mean water gets in anywhre so those boxes stacked on the National hives are not waterproof ! unless the bees propolise the cracks, joins and then that is destroyed when humans lift the boxes off of course ! 2. More space for the bees to work and fill combs. AT ONCE ! not needing humans to go in and decide um oh it needs another box on top ! 4. Easier access for humans to simply take out individual frames of honey or whatever to look at or take away replacing them with new frames easily, not cramped and not needing a lifting of an entire level of frames ! 5. Stability...the Dadant is deer, sheep and human knock over proof. the Size of it and weight ensure this. The National stacked boxes hives are accidents waiting to happen. 6. TRAnsport ease...when moving a hive full of bees honey and frames, one closes up the bee entrance which HAS A CLIP to secure it, and the hive can be lifted by 2 METAL HANDLES on either side of it or forklift lifted if such a hive moving equipement is used for several hives ! I used a hydraulic manual lifter myself in LT. There is NO bees LEAKING issue as there are no stacked loose boxes in this hive construction, nothing can slide or come apart. FRAMES sold in pieces to be fitted like a jigsaw by the buyer are time consuming and being pinewood a soft wood it is not reliable and can be hard to fit together. all wood moves, it can shrink or swell especially softwoods, so this makes construction of frames a very time consuming affair as i recently found out. should be a NO NO in the UK. Like the silly architect fashion in the 60's when people were far too high on substances it seems to me and created Flat Rooved houses for humans, they forgot IT RAINS A GREAT DEAL in the uk ! so it is NOT the Mediterranean or Middle east here where FLAT ROOF houses can be done ! WATER issues ! PEAKED rooves are needed in the uk for bees and human houses ! If you wish to get hand made 2cm thick REAL DADANT HIVES i recommend my latest supplier that I brought 8 of into the uk from recently. FULLY FITTED WITH FRAMES INSULATION AND OUTER PAINTED YELLOW AND BLUE AS PER MY INSTRUCTIONS ! Just look at the DIfference between these 2 pictures of DADANT HIVES ! One is yours in the catalogue, the other is the Factory made 22 Frame Dadant made in LT now in the UK in Wales with Black Bees in it. I provide the link to the main factory producer of Dadant hives in LT, but do not recommend them they ignore me and tell me I can't have 100 hives from them 40 is enough. I am fed up with being told what I can and can't do sometimes as we all are. I must have a sticker saying STUPID on my forehead that only others can see not me for me to spend my life taking so many orders from all sorts of people. I MAKE MISTAKES ! but I LIKE YELLOW GREEN AND BLUE OUTER PAINTED BEEHIVES ! they are the colours of nature ! the sun ! the sky ! the land ! and having different colour hives helps the bees know their own homes and not go robbing other bees homes if close by. I am now a member of a UK bee association. I am ignored by that lot in LT of course being not a full blood LT and having language problems and maybe other reasons. Loads of people sell new made Dadant hives in LT. Loads of wood workers there and PRECISION ENGINEERING is very very good quality I assure you ! not being someone who likes things that do not fit well together ! Loads advertise on Skelbiu, a sort of gumtree website I found and managed to use with help of google translate. SO ! I do not want to over inundate you with too much verbosity, but I hope amoungst the criticisms yes I make here of National Hives and your idea of a Dadant hive that I have not just criticised but suggested possible improvements. PUT LATCHES TO SECURE NATIONAL HIVES on the hive boxes ! PUT HANDLES ON NUC BOXES MADE OF CLOTH ! PUT CLOSING LATCHES ON NUC BOXES AND LATCHES TO SECURE THE PARTS ON THE NUCS ! I was VEry impressed with the polystyrene Nuc Box of 7 frames capacity with feeder ventilation and entrance closable that i bought recently in Jones Ruthin Bee shop ! very impressed ! UNTIL I DROPPED THE 2 PARTS OF THE NUC BOX DUE TO THEM NOT BEING SECURED AND HAVING NO HANDLES TO CARRY IT ! such small things matter greatly ! aid humans greatly ! imagine if that had been full of bees and frames when i dropped it !! eeeek ! horrible for them too ! PUT HANDLES AND LATCHES ON MOVEABLE STRUCTURES THAT HAVE THOUSANDS OF INSECTS IN THEM ! for the bees and humans benefit ! Ok excuse me those read like orders, they are SUGGESTIONS ! sometimes things SOUND like orders when fluffy words are not added to pad them out i say in explanation to that. Who is this nutter writing to us like this ? you may be asking yourself...excuse me yes let me present myself...I am NOELLE MARIE-THERESE OBCARSKAS of Pulford, Cheshire Member of Flintshire Bee Association in Wales as I spend most choice time there and it is only 100 meters from my house. I own bees. Not in great quantities, but would like to one day, and, want more people to have bee hives everywhere. I want TOPBAR HIVES to be made standard for URBAN POSTAGE STAMP SIZE UK GARDENS ! to provide Natural Built by Bees comb that sells out fast in London alone...and such hives are far less swarm risky in urban areas since the bees are busy building comb in yes small 30 litres size low level boxes of oblong shape but top level easy to open design if secured metal roof attachments added. LET THERE BE HONEY FOR ALL ! lands of Milk and Honey ? well lets forget the factory produced milk of our modern times i say ! LET US GET MORE GOOD QUALITY FRUIT AND VEG into our lives rather than this full of antibiotics intensive factory produced meat produced from animals in sh1t conditions that never see the light of day or are able to move in their cramped boxes ! Yes final suggsetion...GET THOSE TOP BAR HIVES better ! NOT FLAT ROOVES ! CHEAPER for the flatpack version of MARINE PLYWOOD ! I might be able to help with that also ! not that i have built one yet myself but i intend to ! I even want those on my LT lands ! am into that still ja ! WE NEED A CAMPAIN ! not a military one ! seems far too many humans are at it again recently taking nasty actions for that ! no we want to be POSITIVE ! to each other and our fellow creatures ! symbiosis ! mutal benefit ! I like Rod Black bee man of Wales are helping the Blackies make a comeback ! providing them with homes ! hives ! in return they will allow us some propolis honey comb and pollinate our flowers and food ! It is all about WIN WIN ! business is WIN WIN to be successful ! it is not about RIP OFFS and no returns on investment ! Imagine ! 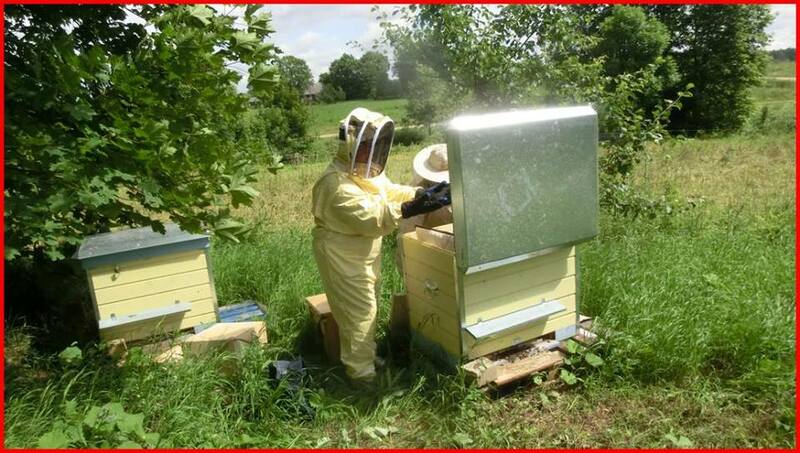 the return on investment of the cost of a UK National hive fully fitted ! some 500 GBP plus package of bees say 300 gbp ! 800 GBP ! honey production and say local sales of 10 kilos of honey in a year at 10 gbp per jar of 500 grams making 200 GBP income per hive for honey from 1 hive in 1 year ! that is not good ! that is AWEFUL ! it is a 4 year return on investment or payback ! does not even take into account the LABOUR cost of supervising the hive and extracting the honey ! ok that is just a days work for extraction but all the same ! ok ok, simple honey comb raw is better value sale...i loved the comb cutter i found at Ruthin shop...that is going to be used for my first uk sale ! hey hey ! then of course um havent sorted the PROPOLIS sheet I need to make that simpler than all that scraping off the sides of the hives...that sells for 40 GBP per few grams of powdered form raw propolis and hives can produce up to 1 kilo but that is wishful thinking in a plastic hive of course. Most of all ! think of the BENEFITS of all this good for health stuff for humans in a world stuffed with antibiotics and full of growing allergies sicknesses etc due to the scheiss we all have to eat nowadays ! The Uk government is far far too interested in filling the pockets of the big boys producing all that rubbish for us in the uk on their over intesive flat east anglia farms using of course even cheaper than the fens labour now not bothered about the gang leaders that own the most expensive houses in London of course keeping the estate agents there happy and filled pockets also...far too much acceptable of such bad practices to support the BEST FOR HEALTH practices and food production that honey and natural smaller scale prducers do far far to better standards and better for the health of the people ! STOP NICOTINOIDS ! how many more TV programes in France recently about the disaster of the bee and honey industry there decimated in the last decades due to all these pesticides used to no real advantage even for the food produced by them ! why is the uk the only eu country not to ban them still ? too busy lining the pockets of the big boys hey that are poisoning us all ! I cease. time to sort my house move out...i came and did several thousand miles to get UK bees that are like golddust so rare nowadays...a little step of a little person but a big step for mankind i say to that ! All the best i say finally and I WANT the best ! for me and others. Please consider. oh i cant refind right now the links to my LT supplier of Dadant hives...but i have them ! cant spell WILERA right and ANYKSCIA is where the BEST hand made dadant i got recently are from....forget willera i dont like them now. BITE is BEE in LT, AVILYS is HIVE, AVILAI is HIVES. DARN IT ! the form only allows 3 thousand caracters ! not even 3k words ! i hve tto cut stuff out ! no...i will do several messages ! part one etc...that is an option. THIs is a Real Dadant hive.